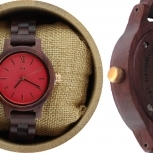 There is plenty of time to stop and smell the roses with this all-natural rose embossed bamboo watch from Angie Wood Creations. Beautifully enhanced with hand-painted miniature roses, this women's watch is truly something extraordinary. 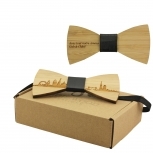 Perfect for special occasions or for everyday wear, this attractive timepiece is bound to brighten up anyone's day. Featuring a delightful rose embellished bracelet, complemented by a light bamboo dial, this watch will allow you to express your creativity exquisitely. As the rose is known to be a symbol of love, and lasts a lot longer than flowers, it would make a worthy anniversary or birthday gift. 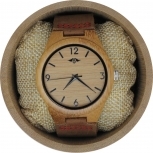 BAMBOO WATCH: This beautiful bamboo watch is ideal for shoppers and gift purchasers who are seeking an eco-conscious fashion accessory. 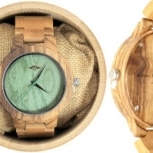 As bamboo is a quick growing grass, it offers sustainability as well as style and is perfect for those wanting an all-natural timepiece. 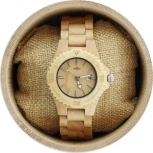 Superbly handcrafted, with feminine charm, this bamboo watch provides a glamorous and engaging touch to your wrist. 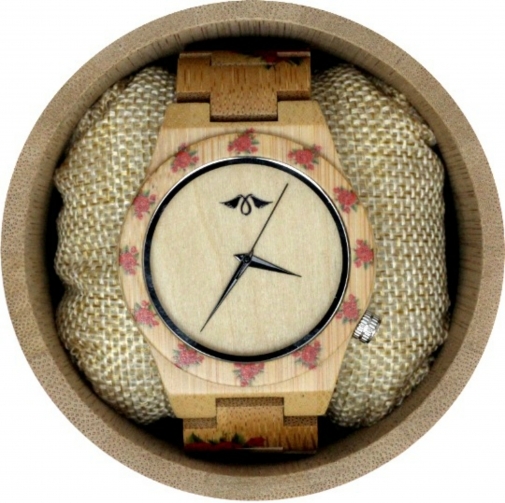 HAND-PAINTED ROSES: Consider this watch a mini work of bamboo art! Hand-painted with bright red roses, this adorable watch is easy to combine with any outfit. Naturally suited to bright reds or blacks, or equally at home with neutrals, this watch will give you the pop of color you need to wow the well-wishers. MINIMALISTIC DIAL: The minimalistic dial is a surprising contrast to the heavily decorated watch and bracelet providing it with quite an understated finish. 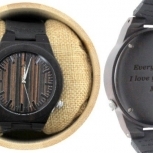 With a silver dial ring to match the push button clasp, and black watch hands, this lightweight bamboo watch will undoubtedly find a special place in your heart.